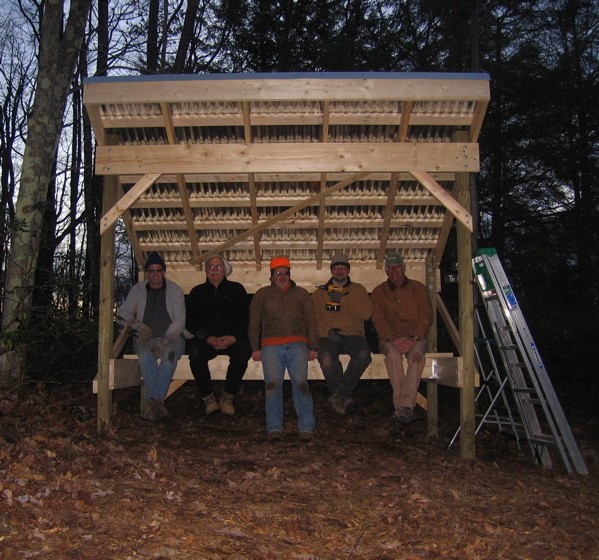 We had a work day yesterday and installed a new trail shelter--the gift of the Harrisburg Kick 'n Gliders ski club. A skier can rest under its roof without removing skis or pack. It sits overlooking the clearing at the top of boardpile, where y ou can see people arriving from eight nearby trails. It was a beautiful, cold day. The Harrisburg contingent, two Daves, both engineeers acting as carpenters, measured and remeasured with running commentary. It was a 'Car Guys' show but in wood! The photo shows, from left to right, John Manifold, Dave Leroy, Michael Gross (me), Russell Cowles, and Dave Powell. Missing workers are Mark Berger and Joe Smith. Thank you all! This is a Flickr badge showing photos in a set called Trail Work. Make your own badge here.